To be fair, do you think Japanese devs are going to choose anything other than Nintendo's huge new flagship? It's like doing the same poll in France and finding out the winner is an Ubisoft game. They rated Fallout 4 over Metal Gear Solid V... 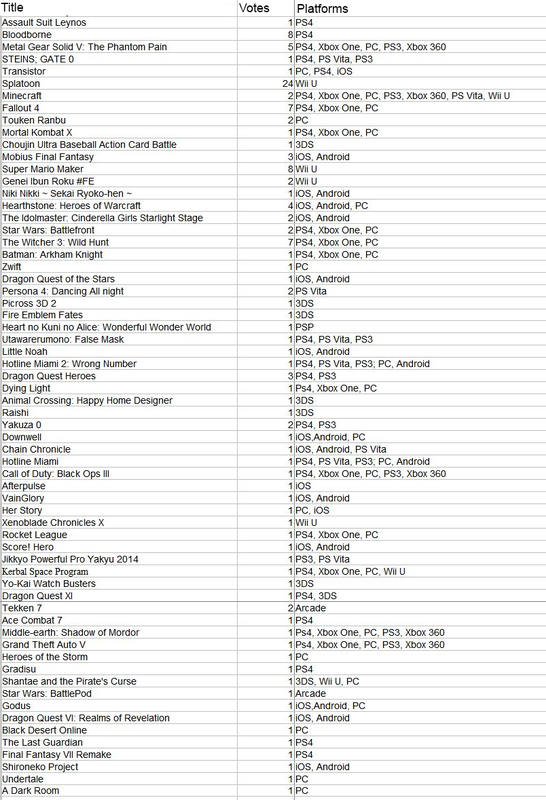 I think that says enough about the poll that they didn't just donkey vote for Nintendo, and if company loyalty was all that was on their mind where are the Sony games on this list? Not that I disagree with the general point, but to answer your question, Bloodborne came second and was published by Sony. What an incredibly smart, and probably attractive group of people. Splatoon IS pretty fantastic! As a frenchman, I honestly doubt that french game devs would vote for Ubi just because they're french. 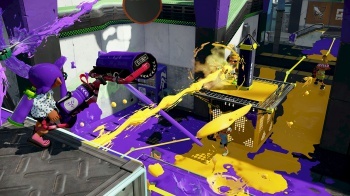 While I don't own a Wii U, I can see why people give so much praise to Splatoon. I think it's a good game as well, even though it doesn't appeal to me much. The Witcher 3 and Fallout 4, even getting 7 votes is pretty surprising, but it's good to see those games getting a bit of love in Japan. Well, that's some of the faultiest reasoning I've seen in awhile. Guess what, Nintendo is not the only developer/publisher in Japan and not the only one who released something big the past year (and it's not like Splatoon was the only big title they released this past year). Though it is funny how they got the landslide winner (with 24 votes), but also tied for runner-up with Super Mario Maker (which got 8 votes with Bloodborne). Anyway, good to see Splatoon keep getting recognition. With DLC through January it'll be interesting to see what the team does next. Lol, of course they did. Not surprising, it's the biggest console game of Japan for 2015. It's the biggest debut of a new IP in Japan since Yokai Watch. In a few weeks it will overtake MK8 lifetime sales and doesn't appear to be stopping. Just this December it sold over a quarter of a million while helping move a lot of Wii U's this Holiday in Japan.